The Lex column in the FT today also argues that the crisis is going to get much worse in developing countries. Their argument is based on the current account deficits. I've discussed that yesterday here. Note that the figure used to illustrate the point shows the current account as a share of GDP (as a share of exports is always better, since it gives a sense of the amount of the country's source of hard currency), and also the stock market, which seems to be doing better in countries with surpluses. The figure actually shows that the only two countries with relatively large current account deficits are Turkey and South Africa. 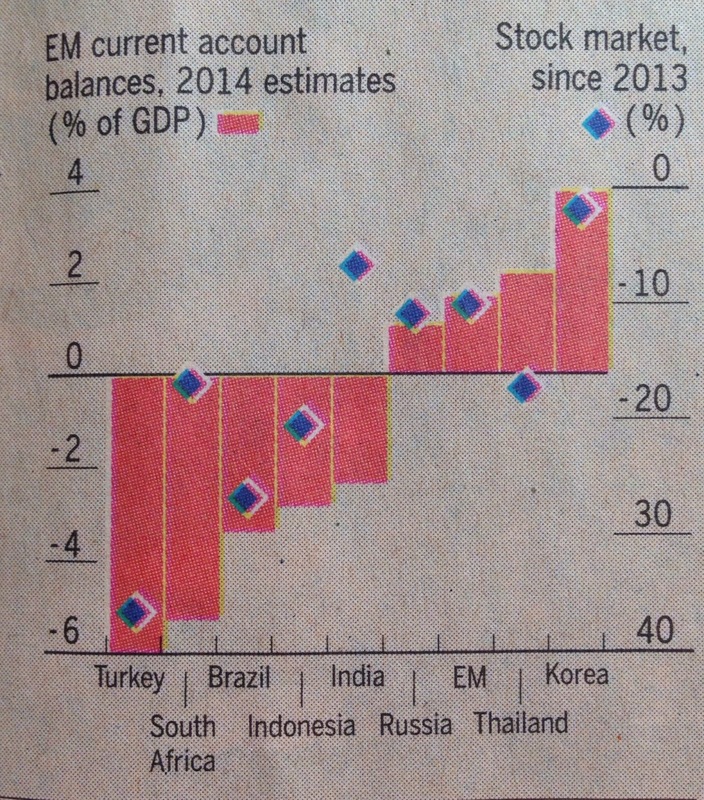 Brazil and India, for example, have deficits that are not that large. Argentina, not shown in the picture, and with more problems than most in it, has a practically balanced current account. Of course the FT, like Roubini, suggests that contractionary policies are what the Dr. recommends. Oh well. There are no hard currencies. Export led nations conduct 'liquidity operations' to ensure that their exports can be accepted in any country worth exporting to. They need to sell or their own economy declines! So really the importance of an import country as a percentage of the exports of another country seems to be what drives the process. If it's important then their own banking system will prevent their own currency becoming too high against the target importer as a matter of policy if necessary (think Yen against dollar, and Swiss Franc against Euro). Who is exporting to Turkey and how big a deal is losing that trade? Not sure a 'Bretton Woods' style analysis is useful in the floating rate era. Somebody has to come in to allow somebody else to leave.